The population is forecasted to grow 23% over the next five years. 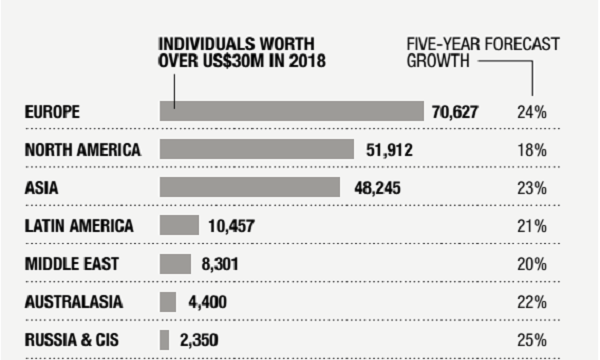 Around 48,245 ultra-high net worth individuals (UHNWIs) worth over US$30m called Asia home in 2018, according to Knight Frank’s latest City Wealth Index. Of them, 18,534 lives in Japan, followed by the 9,953 in China and 3,598 in Singapore. Elsewhere, 70, 627 UHNWIs were based in Europe, whilst 51,912 were based in North America. Africa had the lowest number of UHNWIs at 2,050, the report noted. Whilst the expansion of wealth populations is expected to be broadly steady in each of the next five years, some regions will outperform. UHNWI numbers in Asia, for example, are expected to rise 23%, compared to 18% in North America. Echoing the trends seen in previous editions of The Wealth Report, Asian countries will see the biggest growth in UHNWIs over the next five years. “India leads with 39% growth, followed by the Philippines (38%) and China (35%). Of the 59 countries and territories in our forecasts, eight of the top ten countries by future growth are in Asia, with Romania and Ukraine taking the remaining spots,” the report’s authors added. Meanwhile, the forecast growth in ultra-wealthy people chimes with the findings of Knight Frank’s 2019 Attitudes Survey, which shows that the majority of UHNWIs expect their wealth to increase in 2019. However, there is divergence in the strength of this sentiment, with four-fifths of wealth advisers in the US expecting their clients’ wealth to rise in 2019, compared with just under two-thirds in Asia. “There is more alignment on the challenges posed by the local political and economic environment, however. Some 65% of Asian respondents to the Attitudes Survey, along with 59% of those in the US, said that local conditions would make it more difficult to create and retain wealth in the future,” they said. In the years to come, growing economic and geopolitical challenges such as rising interest rates, the withdrawal of fiscal stimulus, slowing economic growth and trade tensions, not to mention Brexit and the ongoing upheaval in the Middle East are set to translate into moderate wealth creation.